Our lungs are pretty happy about OSHA’s ruling on silica dust exposure. The Occupational Safety and Health Administration has recently passed a final ruling to curb the detrimental effects of breathing in silica dust created from cutting and grinding materials like concrete and stone. The targeted inflictions include lung cancer, silicosis, chronic obstructive pulmonary disease (COPD), and kidney disease. OSHA estimates that the new rule will save 600 lives each year, as well as preventing more than 900 cases of silicosis once the rules are fully in effect. Read on to learn a little more about the new rules on silica dust exposure for workplace safety. The new rules for limiting silica dust exposure highlight the following key provisions. 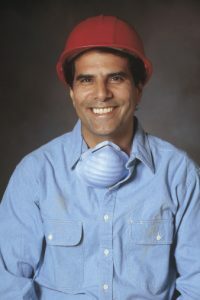 Silica dust exposure must be limited to no more than 50 micrograms of respirable crystalline silica per cubic meter of air, as averaged over an 8-hour work shift. Train and educate employees about silica dust exposure risks and control. The new ruling also provides flexibility to help employers, especially small businesses, protect their employees from silica dust exposure. Construction Industry must comply by June 23, 2017 — one year after the effective date. General Industry, Hydraulic Fracturing, and Maritime must comply by June 23, 2018 — two years after the effective date. Hydraulic Fracturing Engineering Controls must comply by June 23, 2021 — five years after the effective date. For more information about the ruling and some background info on the dangers of silica dust exposure, check out the OSHA information page right here. This entry was posted on Friday, June 3rd, 2016	at 1:19 pm	. Both comments and pings are currently closed.